What Explains The Bizarre Price Surge In Oman Crude? While oil traders have been generally punting to the "November Iran sanctions" as the reason why in recent weeks a bevy of $100 oil forecasts have emerged (even if Goldman disagrees), a more immediate cause for the prevailing oil price bullishness has emerged in recent days and it has to do with Oman oil - a low-quality crude - which this week turned into the world’s costliest oil benchmark, "confounding traders and throwing the market into turmoil" according to Bloomberg. 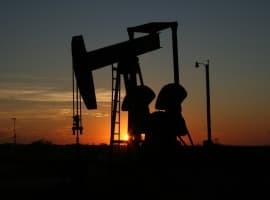 Traditionally an obscure, little used benchmark, Oman oil which trades on the Dubai Mercantile Exchange and which will play a key role when Saudi Arabia sets the cost of its shipments to Asia next month, is now more expensive than New York’s West Texas Intermediate and London’s Brent. In fact, earlier this week, the Oman futures contract rose above $90 a barrel making it one of the costliest grades in the world. On Wednesday, Oman briefly traded as high as $90.90 a barrel on the DME., although after some profit taking by the end of Singapore trading at 4:30 p.m., it was at $88.96 a barrel, still materially higher compared to $82.15 for Brent, and $72.36 for WTI. According to Bloomberg's Javier Blas, the dramatic 2-day gain of 11% reverberated around the annual Asia Pacific Petroleum Conference in Singapore -- one of the biggest gatherings of the global oil-trading industry. “Have you seen Oman?” replaced “Good evening” for many in the cocktail circuit. So what drove the bizarre price surge? 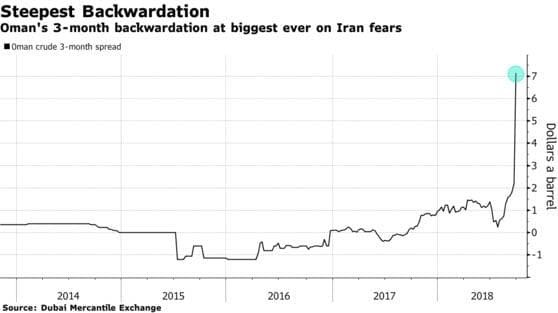 Here, again, Iran emerges as a key culprit because among the reasons suggested to justify the price surge includes lower supply of similar-quality barrels from Iran due to U.S. sanctions, coupled with growing purchases by top crude importer China. 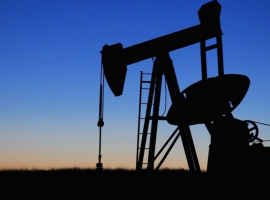 Commenting on the speed and strength of Oman’s surge versus other benchmarks, industry consultant JBC Energy GmbH said in a report on Thursday that "it is very unusual to see DME at a premium to ICE Brent, let alone at such a high level. Given that the vast share of Omani crude is delivered to China, it is easy to conclude that it is the main driver for this unusual jump." As Bloomberg further explains, the status of Oman crude was boosted by Saudi Arabia’s decision to start using it as a reference in how it prices supplies to Asia. 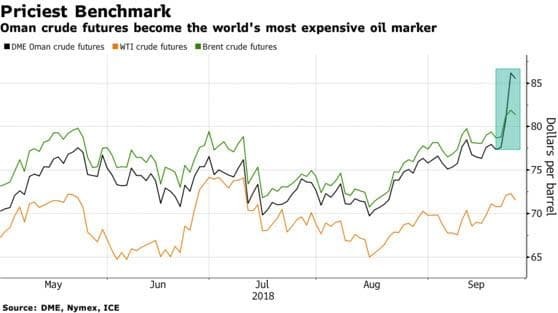 Now, concern is growing over whether the surge will inflate the cost of the Middle East producer’s cargoes compared with those from Kuwait and Iraq, who haven’t switched to the new benchmark, according to a Bloomberg survey of five traders and refiners. Of course, it is likely that Saudi Arabia may soon price itself out of the market, which in turn will normalize the price spike and send Oman lower. Hinting at just that, Bloomberg quotes one executive at an Asian buyer who said it might consider seeking to take fewer the cargoes from Saudi Arabia if they are too expensive versus other supplies. "While we expect the spread to quickly return back to normal levels, Oman should remain relatively strong, reflecting the increasing tightness in the Asian crude balance,” JBC added in its report. Healthy processing margins and reinvigorated independent refiners in China are providing ample demand, it said. The closely watched spread between Oman and swaps for Dubai crude, another key Middle East benchmark used to price regional cargoes, widened to a record of over $10 a barrel earlier this week, surpassing the peak set in 2011 at $6.22 a barrel, according to data from S&P Global Platts. It was at $5.73 a barrel on Thursday. Whatever the reasons behind Oman's surge, they incorporate both the supply- (Iran export cuts) and demand-side (China's relentless purchases), as Bloomberg's Alex Longley summarizes, "it's a signal of just how scarce supply has become in the Middle East." That, in a nutshell, is why trading houses were talking up $100 crude earlier this week, and why we could be about to embark on the tightest quarter in supply-demand balances in more than a decade. And since Wall Street surely learned the lessons from the 2008 crash which according to some was precipitated by the oil-superspike to $150 (following by a historic crash just weeks later), we wonder if allowing oil to surge above $100 to the highest price in 5 years at a time when the global economic expansion is now one of the longest on record and many are calling for an economic contraction, would be the most sensible thing to do at a time when such brand name investors as Ray Dalio and Ken Griffin are both warning that the next recession and crash will hit some time in 2020.